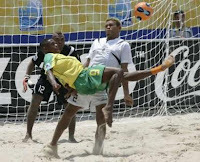 Mexico and Brazil both got off to winning starts in the 2007 FIFA Beach Soccer World Cup earlier today. Mexico beat Russia on penalties after a 2-2 draw at the end of extra time. Ricardo Villalobos and Oscar Gonzales had given the Mexicans a 2-0 lead before their opponents came back into the game with two goals in three minutes. After a goalless extra time period, Mexico held their nerve for the penalty shootout, winning 2-1. Brazil had a much more comfortable result in their first game of the tournament, defeating the Solomon Islands 11-2. They ran the play from the opening kickoff and never looked back after Buru gave them the lead one and a half minutes in. Double strikes from Junior Negao, Daniel, Bruno and Sidney, along with a second from Buru and a single goal for Duda gave the home crowd much to cheer as Brazil romped home to victory. The two Latin American sides now meet each other in the second game of the group on Sunday, with a win for either side likely to book a place in the Quarter Finals. Argentina and Uruguay both get their campaigns off and running tomorrow. Argentina play Nigeria in a 9:30am kickoff, with Uruguay facing Italy at 11:00am.